I have noticed that as soon as I cross the border between Zimbabwe and South Africa by road, the adverts I start seeing on my phone become relevant. I see specials from Pick n Pay and offers from Woolworths, and when I travel a few metres after seeing those ads I can actually see the store and possibly even walk in and get that great deal. Haven’t you noticed? Okay then, how about all the ads that bombard you as you scroll down your Facebook feed? Ever noticed how most – if not all – of those ads are from America, and that they are usually related to your interests on the internet? Well, at some point we have to start asking why our own local businesses are not doing the same, that is, aggressively marketing their products and services online, and how they can jump on the wagon of digital marketing. A simple Google Search will tell you that digital marketing is better appreciated in developed countries than our own African countries. This is a very sad reality, considering Africa stands to benefit more from the digital economy than possibly any other continent right now. The latest reports on digital penetration show that there is a 20% increase in the number of internet users in Africa. Yet our local businesses still fail to take full advantage of the opportunity that digital marketing presents. A lot of business owners have sadly accepted the myth that digital marketing does not work in Africa. This is simply not true. Many transactions are being completed online by Africans in Africa (not the diaspora). Think of all the transactions that take place on sites like BeForward, AlieXpress and eBay. True, data charges are higher in Africa than anywhere else in the world, but that hasn’t stopped us from purchasing goods online. The kicker is, most of this money is not circulating within the African borders hence it is not serving to grow the economy of our nations. Another reason why many businesses strongly feel that digital marketing is not relevant in the African context is that most online efforts made by local businesses do not translate to any money. At the end of the day, the profits made from marketing efforts are the true indicator of the success of any marketing campaign. If no real money is brought into the business, then the campaign was a failure. Most local businesses fail to tie their digital marketing efforts to the main objective of the company – which in most cases is to make a profit. If we are being completely honest, most of our local businesses don’t even understand what digital marketing is. To them, it may seem like aimless posts on social media that do not serve any purpose other than to waste time and divert from their core business. This is not entirely their fault though. For a long time, digital marketing has been presented to us as a very foreign concept that is supposed to work miracles for a business. It is no wonder that to date, senior management still opts for traditional methods of advertising over the new digital marketing “sensation” because at least they are familiar with how it all works. It is only very recently that we have begun to see some education happening on this topic. One of the most notable efforts made to educate business owners and leaders about digital marketing is the Digital Advertising Convention 4 Africa, which will take place at Cresta Lodge Harare from the 14th to the 15th of June. This year, the DACAfro convention is running under the theme “Growing Businesses through Digital Platforms”. Digital marketing experts from around the world will come together to share knowledge on how to successfully grow businesses using digital media. Over a hundred delegates are expected to attend from all over Southern Africa. 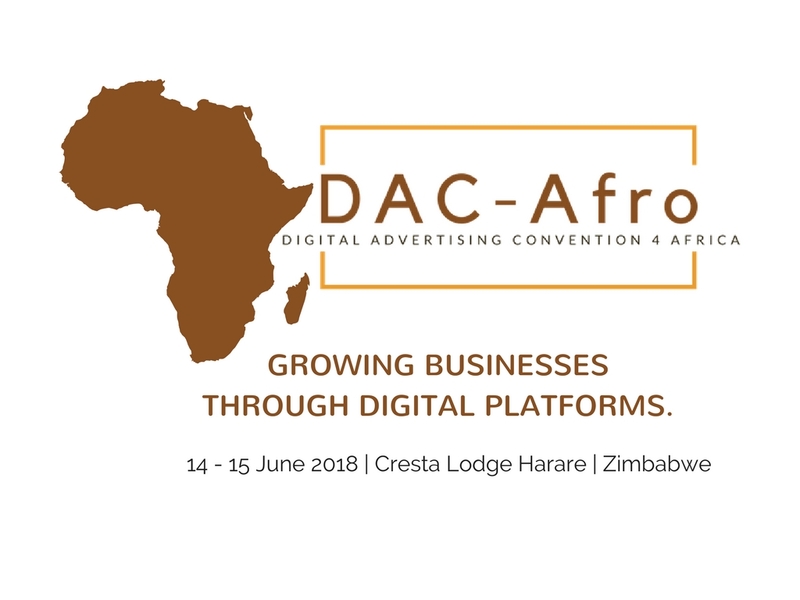 DACAfro might just be arguably the most global digital marketing convention ever to be held on Zimbabwean soil. Anyone can attend this event from literally anywhere in the world – and we don’t mean through the overdone Facebook live feeds. There are actual webinar tickets on sale, and purchasing one of these means you get online access to the whole convention. Plus, you get to participate in the question-and-answer sections, just like you would if you were physically present for the event. However, the Big Question remains: Should You Attend DACAfro? The answer to this is: OF COURSE. There is no denying the fact that more and more Africans are beginning to rely on the internet for information on literally anything and everything. This means that if a brand (business or personal) is not found online, it is perceived as being less established and therefore not worth spending money on. Hence, the lack of digital marketing skills in any company can prove to be highly detrimental to the success and profitability of that company. If you are a business owner, a CEO, top management, marketing director or you basically call the shots in any organisation, then you absolutely need to attend DACAfro 2018. Some of the speakers are expected to fly all the way from the UK just for this event. We don’t even need to mention the fact that the networking opportunity that such a convention presents is one that you can’t afford to pass over. Other shot-callers and influencers are expected to attend, so you will get a chance to mingle with like-minded people outside of your own business. To purchase a ticket, or to find out more about DACAfro, head on over to their website, www.dacafro.com. Here’s to “Growing Businesses Through Digital Platforms”. I think this would be interesting but its waaaaaaaay too rich for my blood! That aside, who are the speakers for the event and what companies are supporting the event, there nothing in the brochure. Personally, I get put off by events that offer certificates, because it doesn’t make sense what is being certified. If a certificate is for attendance, or participation, then it is a gimmick. Interesting read. Is there a certificate at the end of the program? Yes, all attendees will have certificates. This is quite interesting, looking at the amount of businesses in Zimbabwe that still use traditional vs digital marketing methods. Great platform to enhance digital knowledge and great networking opportunities too. If your company can afford a billboard, you can’t afford to miss DACAfro! The huge advantage of digital marketing is that it targets people who are already interested in your product through search engine results and social media profiles, among other strategies. So much nodding in agreement. There is no doubt that its not a matter of “if”, but “when”. The businesses that understand and leverage digital will win. Lool at companies like Woolworths in the UK. They were too slow to react. Look at the influence of Amazon on the high street store. You have to adapt! Would love to attend. Email me all the details. Costs, duration per day and timetables. Thanks for the article Trust. This convention sounds very interesting. Knowing some of the organisers I believe this will be an extremely well organised conference with a very high level of speakers and information presented. I’ll be attending the webinar from the UK! Wow, that’s great. It’s going to be an interesting having people from all over the world attending.